Are there any reasons I wouldn't want to do this upgrade for the FT-5 R2? Am I missing something?? I can only tell you what did or didn't work for my printer. I have some high quality 0.9 degree NEMA17 motors left over from a past project. They have winding resistances and currents that are surprisingly similar to the ones that FT supplies. Their torque curves are different though (see below). So I tried one on the original FT-5 non-geared extruder first. Couldn't get anywhere near enough torque out of it. So I scrapped my thought to try them on the X, Y or Z axes and made other plans. I changed to a geared (E3D Titan) extruder instead which has approximately a 3:1 reduction ratio (it doesn't equate to the exact gear ratio because of a difference in the extruder gear diameter). Tons of torque, no real problems. Very happy. Then I changed the driven Z pulleys (on the leadscrews) to 40 tooth versions. Now it has a 2:1 reduction ratio with the stock motors and motor pulleys. Worked like a charm and I now routinely print with 0.1mm layer heights (and I have tried smaller ones). I simply couldn't do that before. In general you won't get as much torque from a given 0.9 degree motor as from its 1.8 degree counterpart, all other things being equal. Unless you spend a ton of money on super precision (ultra small rotor to stator gap) versions. They will run out of torque at lower stepping speeds, and probably don't have as much to start with. A Titan (or similar) setup and a pair of 40 tooth pulleys is a whole lot less expensive. Quite a few of the "hackaday" articles are interesting. But you have to ask yourself who wrote them, if they actually tested what was in it, and in this case was it written for a smaller (lighter weight component) printer setup? Were they running the resulting printer slower, assuming it was even built? There definitely are people who run 0.9 degree motors on FT-5's. My particular motors just weren't remotely powerful enough at the same driver currents (or even higher). Am I willing to invest in different ones as a test? No. I am very pleased with the setup I have at the moment. Thanks for your reply Ron. Hmm, doesn't less teeth result in higher precision? As I understand it, 40 tooth pulleys would actually result in lower resolution than 20, not more. I think you may be putting the tooth counts in the wrong places. Or there is something wrong with the calculators. With the stock setup the motor pulleys and leadscrew pulleys are both 20 tooth. This is a 1:1 drive ratio. So when the motor moves 1 step (or microstep as you wish), the leadscrews will move by exactly the same angular amount. However when doing what I did (stock 20 tooth motor pulleys with new 40 tooth leadscrew pulleys) it takes two steps of the motor to move the leadscrews the same amount as if everything was "stock". So this is a 2:1 drive reduction ratio. Therefore the effective resolution of the motor is doubled (increased). Instead of 400 steps/mm on the stock vertical it now becomes 800 steps/mm. On the Z axis the increase in step speed to get the same linear speed is of no importance. On X or Y it might be somewhat of a concern because you would be shifting upwards in the torque/speed curve of the motor. That said, with 24 volt drive to the motor step sticks, it really doesn't matter. Oh, it does look like I was mixing things up, oops! I am still pretty new to this. I'm also distracted by a screaming toddler and barking dog. Thank you for your patience and detailed replies Ron, I really appreciate your help. Wow, so this would accomplish basically the same thing for a lot less money. Awesome tip!! Thanks Ron! .i run .9 motors but have duet wifi board and 2 amps to each so plenty of power. I am betting it would be far cheaper to go with 1.8 motors and a few pulleys to change gear ratio not to mention the extra torque you get by design. If you don't have a high end 12v supply (i use gaming rated pc PS) highly recommend 24v all sorts of advantages. It gets you a lot more torque and resolution for the buck on the Z axis. For X and Y all is not lost though. You can also change from 20 tooth to 16 tooth motor pulleys which should gain about 25% on resolution with a corresponding gain in torque at the belts. However, without a 24 volt PSU you might have to reduce the maximum X and Y speeds a bit. That was another mod I was planning to try one of these days, perhaps in conjunction with an "H" drive conversion. With a stock FT controller board and "normal" step sticks a 24 volt PSU makes all the difference. I am very happy I converted mine to 24 volts a while back. With the more exotic step sticks such as TMC21xx it is borderline mandatory because of how they operate, particularly so for TMC2100's. Might change to 2mm single-start leadscrews with 20T pulleys at some point though. My prints look good except for warping/curling. I need to figure out a part cooling fan. 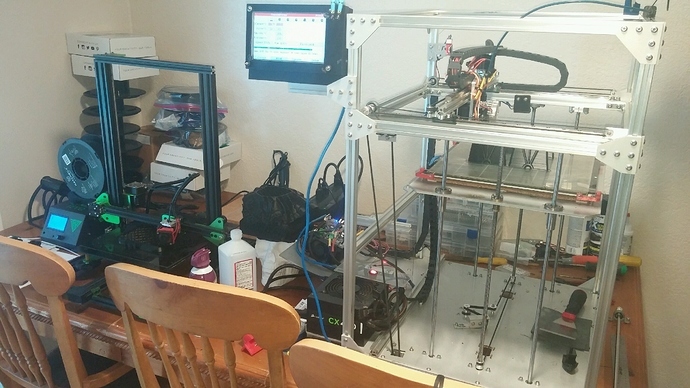 I skipped stock and instead installed a Titan Aero with E3D pancake motor, so I'm still working out what I'm going to do for a part cooling fan and BLTouch. There are 16t motor pulleys for X and Y in my printer's future for sure (parts on order). However I am also looking at doing an "H" drive conversion based upon the really positive experiences I had with an Ender-4 printer recently. It will take a lot of mass out of the X gantry assembly. What you did for Z looks great by the way. I really do like what @Matthew did, and I highly recommend the 40 tooth pulleys on the lead screws. With the gear reduction a single motor is certainly powerful enough to do the job on Z, even with the lower currents our typical step sticks are capable of. A slightly longer belt would get it back onto the right hand idler, but frankly it's probably just fine as it is. Mine still has the dual motor setup and my fancy 1350mm belt setup (photos posted elsewhere) mainly because I am far too busy right now to pull a motor out. But I will one of these days. I'll keep the open center area I have now though because that's where my bed heater wires neatly coil into (by plan). I am sticking with my trusty old 1.8 degree motors from FT for the major motions, but I do have a pancake motor on order for the extruder (Titan). Anything that can be done to reduce the mass of the X carriage and print head slider should help I would think. The gear reduction on the Z axis and anti-backlash nuts helped a lot too, as did the double platform bearings. I printed one of these recently for example at 0.15mm layer height in PLA at around 80mm/sec (max) and the print quality was simply great. I can't wait to paint it this weekend. With all due respect to Ed "Big Daddy" Roth. 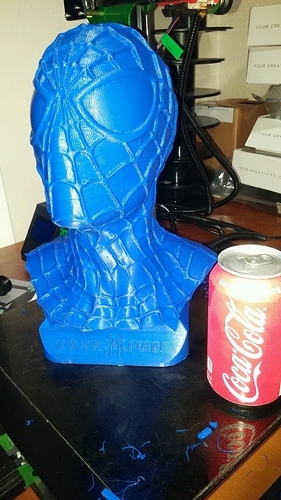 The Spiderman bust is quite impressive, I must say! I have printed some big things in X and Y, but nothing (so far) quite that tall. 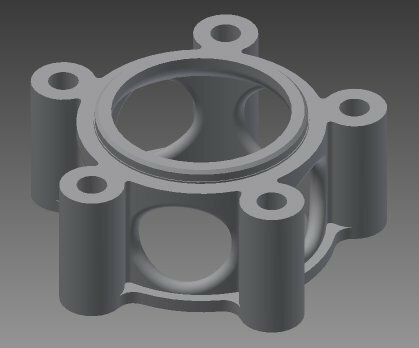 I am about to print some rear wheel spacers for our garden tractor for example. They will be about 7" in diameter and 2.5" in height with 70% infill. But before I print these I have to get a UPS installed ahead of the printer. 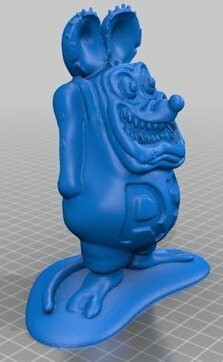 We had the power blink out for a few seconds while printing Rat Fink and so I lost one copy about halfway through and had to start over (it was a 4.5 hour print). Good Call!, spidey at .1mm took 5 days 4 hours and 3 minutes on the nose to print. As you can see 2nd attempt failed on day 3, hence the shiny new ups and printing 3rd now. 1st was for friends kid but i liked it so much am making 1 for myself... I have a 400 watt ups which works great for the 2 printers. here we not only get blackout but brownouts as low as 50VAC are not uncommon so cruel thing to do to a power supply. of all the people to screw up this kinds of math... LOL i totally forgot about my kenova 120v 750 watt mat. 1st time heater came on, it made the UPS cry. no worries since it is direct ac, have it on surge only port. both printers run off this little ups but no idea of how long. loss of heat on ft5 shouldn't be an issue once print is above 1st few layers, doesn't appear to make any different if heat is on on my pei bed or not, every thing sticks great or too well if not careful. I haven't had any skipping or other issues with my E3D 0.9 pancake motor (set to ~1.2v) on the Titan Aero, however I haven't tried over 60mm/s yet. With 1.8 motors and 16T pulleys on X and Y it's now at 100 steps (stock 20T is 80), but with 0.9 motors that doubles to 200 steps. 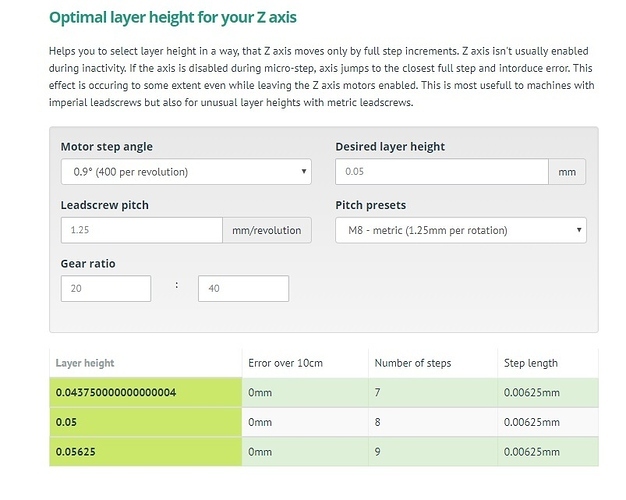 On Z with the stock 20T pulleys, four-start 8mm pitch leadscrews, and 1.8 motor, it's at 400 steps (step length 0.04mm), and with 40T pulleys that goes up to 800 (step length 0.08mm, which can cause issues with some common layer heights like 0.2, but that's easily fixed by using something like 0.24 or 0.16 instead). Found a decent deal last night and ordered single-start 2mm leadscrews with anti-backlash nuts. With 40T that's a whopping 3200 steps which is definitely overkill, so I'm going back down to 20T for 1600 steps (step length 0.01mm, which is good for pretty much any layer height). I think the big decision for people to make is one of money. Buying pulleys is significantly cheaper than motors and leadscrews and you can get a pleasant bump up in quality for next to nothing. I'm willing to spend a bit extra for a little more without going too crazy. I'm also more interested in quality over speed, so that's another consideration one should make. I have a couple of derelict UPSs laying around (two 400VA and a 1000VA) but all of them need new batteries. Before I tackle the spacers though, I think that it will be a must to have at least the main logic backed up with a UPS. They are likely to be around 10 hour prints each due to the almost solid infill. Update- Speak of the devil, PG&E left us in the dark again yesterday evening for about four hours. The pancake motor I have on order is a standard 1.8 degree version, and my extruder is the older "standard" Titan. With its ~3x gear reduction ratio I don't anticipate any issues with it. And yes, pulleys will get you much more "bang for the buck" than motors and lead screws. I know this is an older post, but I just received the R2 FT5 and will be building it this next week, as I am waiting for a few parts from 713. Ok, do you know what pulleys the R2 comes with? AND Could you provide a product link to the pulleys that you recommend to change for X Y and Z? 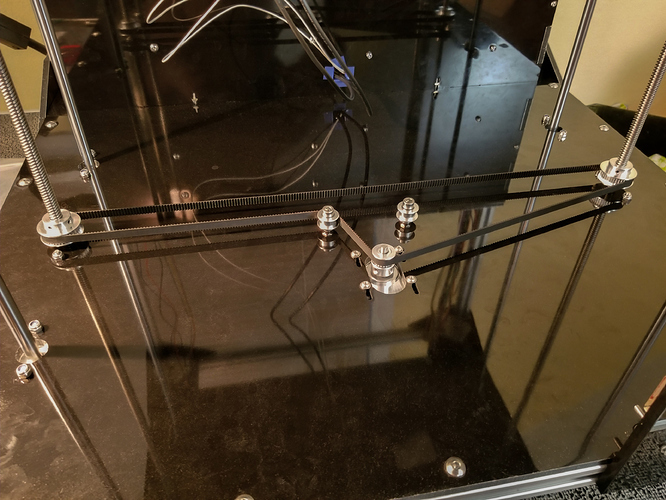 or is it just to the Z axis that needs changed?